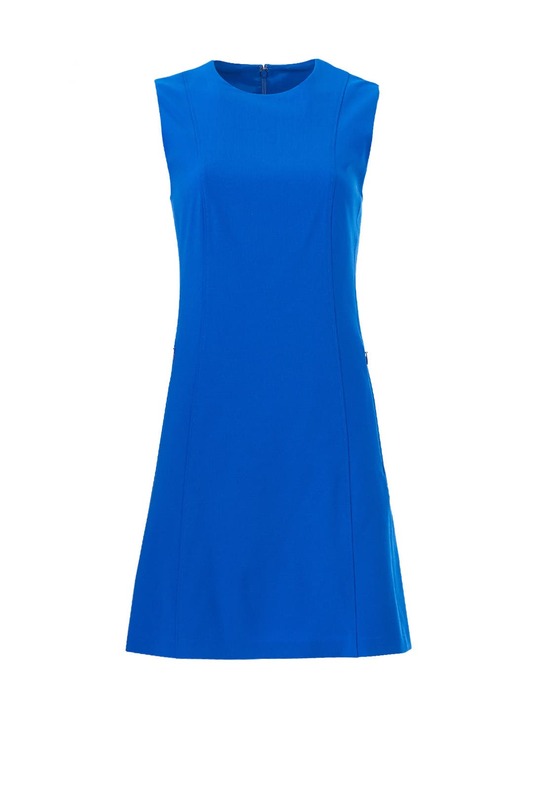 Simple yet chic, this structured a-line Theory dress features shapely seams and side-zip pockets. Complete this monotone look with the Blue Robinson Chain Wallet by Tory Burch. Also available in Printed and Fuchsia. Blue wool (96% Wool, 4% Elastane). Hourglass. Sleeveless. Crew neckline. Hidden back zipper with hook-and-eye closure. Front zip pockets. 34" from shoulder to hemline. Imported. 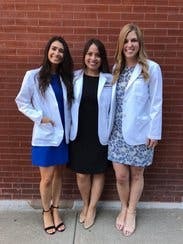 I wore this classic shift for my white coat this spring! The length is perfect and it fit very nicely under the baggy/square shaped coat. I will say it runs a bit large- I am normally a 2 in dresses, but I ordered the 0 in this and it fit great. So size down for your backup! The material is beautiful and would be perfect for work or a summer wedding. The color is standout- you'll definitely shine in this dress! Would highly recommend! This dress is a beautiful shade of blue. It's an easy wear and very comfortable. It does run a bit large and I wish it was more fitted in the waist. 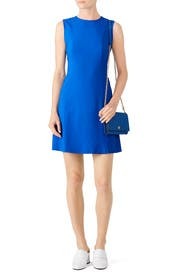 This dress is a very beautiful shade of blue. 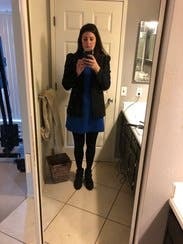 I wore it with a blazer for work and then met up with friends afterwards. The length was appropriate and the material was light--perfect for a commute in the heat. Fits great and is super comfortable. It has pockets but if you use them, you can see the outline of what's in the pocket on the outside of the dress. Love love love the color of the dress. It is a smaller than average fit for theory. Usually in theory I wear a small but in this case an eight was certainly the right size and I definitely could not have been a six. 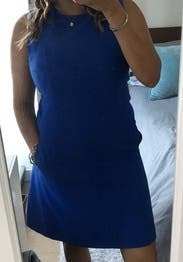 Boyfriend said that it was like an upscale tennis dress with the zipper pockets and the slight fit and flair style which I guess I agree with somewhat. 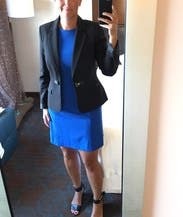 Overall it was so nice, do not size down, brilliant color, possibly too short for anyone over 5'3?in very professional environments as it may be too short. I wore it for fun. The color of this dress is gorgeous! The cut is typical for Theory - a bit on the small side. 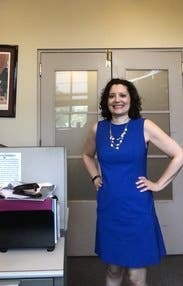 The length was a bit shorter than I'd typically have for work, but it's still a great dress! Better than I thought it would be , cute and smart! The length & fit was perfect, however this dress is a little more boxy than what I'd normally wear. I did wear it 3x though! This is a great summer work dress. So many compliments. The pockets are a fun and unique detail I'm seriously considering buying this one. Absolutely love these Theory dresses. Perfect for work without a cardigan. And I always try to match it up with a fun necklace since the dress is rather plain. But it's so comfy and perfect for work! 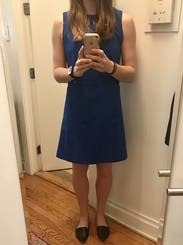 A great summer dress for work. The material is stretchy and thinner than I expected. And no one mentioned the best part - it has POCKETS! I'm 5 3 and it hit right above the knee. Beautiful color, very flattering fabric and cut. This is a perfect work dress that could also be worn out to dinner after. I thought it ran a little large, especially in the bust so if you are smaller chested you may want to size down! Definitely a little short for work. Loose around the waist. Nice color. Had to be ironed prior to wearing. Zipper pockets are not functional. Dress was fine, but nothing to get excited about. I only rented it bc there was such limited stock of work appropriate dresses. And the only reason I would rent it again is if again there was a limited stock of work appropriate dresses. This dress is amazing. I was hesitant to get it because I have hip dip and it looks like a dress for narrow girls. However the dress actually made me look narrow. I normally wear a zero or two, I got this in a two and it was perfect. I would not size up and a zero maybe would have fit but with this cut better to size a bit up so I went with the two. Blue will pop on blondes. Nothing I can say negative about the deess, if you size it right you'll love it regardless of your frame. This dress would've been really cute, but the 6 (my usual size) was just way too big. Couldn't wear it. Didn't end up wearing this because it was just a tad too short. I will rent again in the 8. 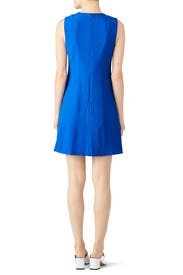 I ordered this dress for work and I really liked the color and material. It is on the shorter side, so this may not be the dress for you if you aren't comfortable with that. Also, it is slightly bigger in the chest area for a smaller busted girl. Overall, cute and simple. Can be paired with jewelry to make it more dressy. Very nice color-- got several compliments. Great dress-- perfect for work or a business casual type event. My only issue was that it arrived a bit wrinkled and then got much more wrinkled over the course of the day as I wore it. Fits so well! The zipper pockets got a little bit stuck but if you work it they open. The color is incredible. The fabric isn't too heavy -- wore it on an almost 100 degree NYC day and I felt cool (as cool as possible, anyway). Beautiful flattering dress, great color! I love this theory dress! I struggle with their clothes sometimes as some styles run large, but this was perfect. Flattering yet professional, great color but appropriate for work. Wore to work on a friday and then out for drinks. Love love! 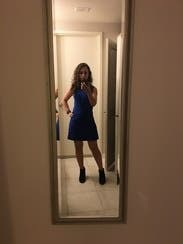 loved this dress! Great color perfect for work! Love this dress... I wore it to work - but it's also perfect to wear right out to happy hour after! Color was nice and bright. However, for small busted women - it was quite large in the chest (I'm a 32A) so I'm not sure if I should have gone a size down or not (I wore a 4). Nice basic and attractive work day dress. Nice fit. Not too tight. Not too large. Comfortable and pulled together look at the same time. Loved it and wore it twice. Perfect for dinners out. It was very comfortable and the perfect length. Loved the color. 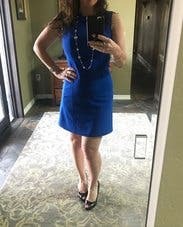 This is a great work dress that I wore to a few client meetings. I would hesitate to wear heels with itfor work since it is a little short (and I'm 5 ft 2). There are zipper pockets on the dress, but they are more for show as the dress shape would be compromised if you actually put anything in the pockets. love this cut. love this color! great dress from theory. flattering, and fun! The color is gorgeous, the fabric is good quality, and the cut is flattering for girls with or without curves (though if you are curvier on the bottom half it might be too short for work). The dress fit my petite frame very nicely though. 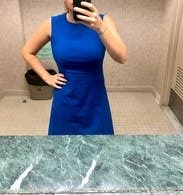 Loved this dress - wore it to work. Received so many compliments. Slightly short for a conservative workplace, so I wore tights under it. Still super cute! Very comfortable too. 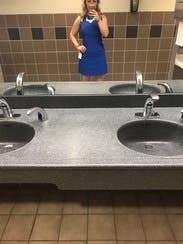 I really loved this dress - it has two zip up pockets along the front and was flexible and comfortable and in my school color (I'm a teacher)! It was perfect for work with a sweater to cover my shoulders.